Sorry for the long absence from my blog. I'm still not 100% recovered from being sick for a couple of weeks with some nasty bug that is going around plus we have had some challenging family drama and other just regular things....and my son celebrated a birthday! He's a remarkable young man....very bookish and scholarly.....and never without Othello, his black feline companion, in his bookshelf-lined room. I am quite proud of my son and so thankful for him. So I wanted to make him a extra special birthday card. I even decorated the inside of the card!! Something I hardly ever do. Love your card and the inside looks fab too. Hope your health keeps improving - being sick can take a while to get over. That stamp is amazing - totally luv that kitty. Thank you for coming to play at IKEsWORLD CHALLENGES and for also purring along to SUYP Cats Challenges with your lovely card :-D I hope your son really enjoyed his card. Oh WOW Janis, this is beautiful. No wonder your son liked it! How could you not? 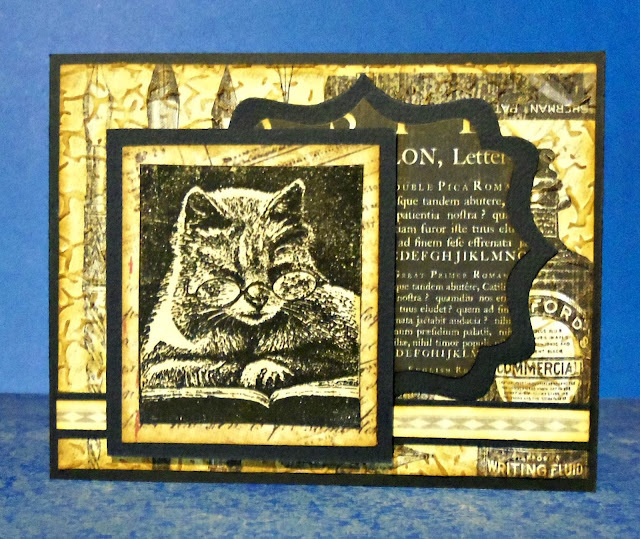 Oh, what a wonderful card for James...and for anyone who loves cats, books, vintage designs....or all of the above! I love all three so of course this card has me oohing and aahing over that Graphic 45 paper and the scholarly kitty. This is a card that calls out to be tucked up oh a bookshelf and kept for years. What a great card to get you back in the swing of things and one that your son certainly loved and will treasure. Hope you continue to feel better!! I love the card you made for your son, it is EXTRA outstanding! Of course he would love it, so many wonderful details!! A really lovely card and it's lovely to see you at Penny Black and More challenge Janis, many thanks for joining in. Wonderful card...love those incredible images. Hope you are feeling better real soon.